Hi, guys! 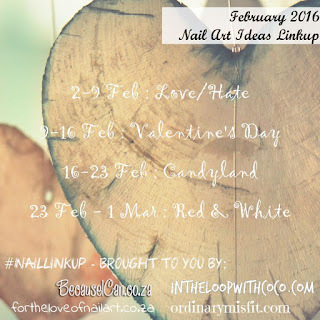 Today I have my mani for the first Nail Art Ideas Linkup (N. A. I. L.) February theme - Love/Hate. The idea behind this theme was sort of "opposites attract". I started with a base of Bliss Polish White Hot on all my nails. I then applied some zigzag nail vinyls and got the black edges using Sally Hansen Insta-dri Black to Black. On my accent nail I applied a heart decal that I made using my DRK Nails stamping mat and Stached Polish Love Language. 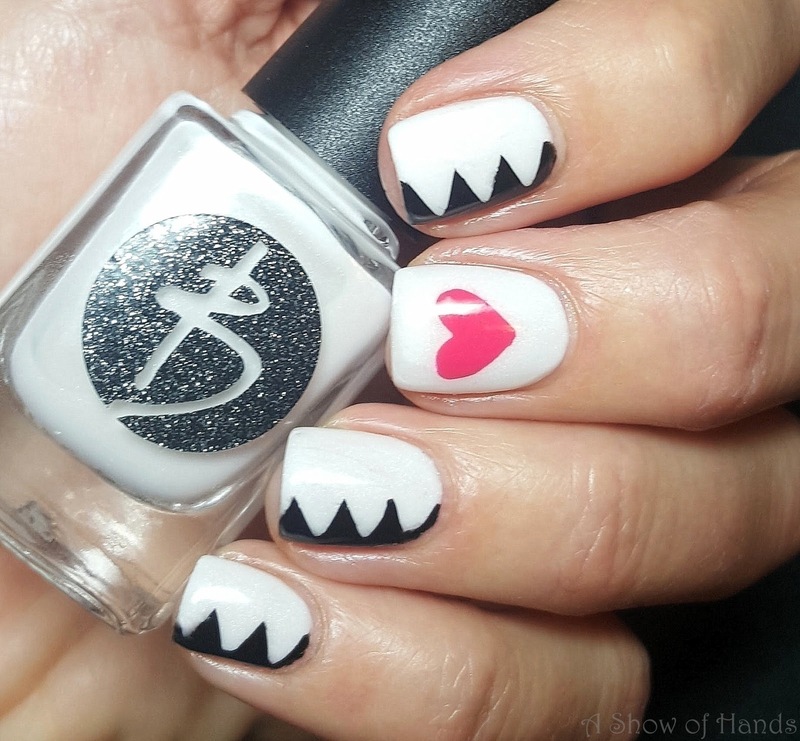 Thanks so much for looking and check out the other Love/Hate manis, too! Hi, guys! I've got a quick post tonight of the nails I wore today for Mardi Gras! I started with a base of Bliss Polish She's A Winner (my favorite gold polish) and topped it with China Glaze Glitter All The Way. The glitters are a perfect mix of gold, purple, green, and red. Simple, yet festive! Hi, guys! Yesterday was National Wear Red Day to support Go Red for Women. 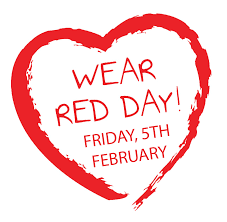 Wear Red Day is held annually to help raise awareness about heart disease, which is the number one killer of women. The red I wore is Potion Polish Vixen and it is soooo pretty! 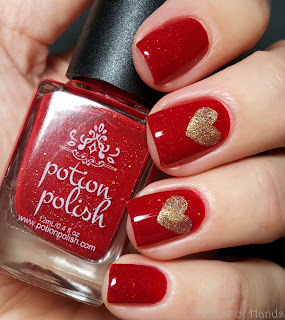 I added a couple of hearts using nail vinyls and Cameo Colors Lacquers The Adoption Before Christmas. 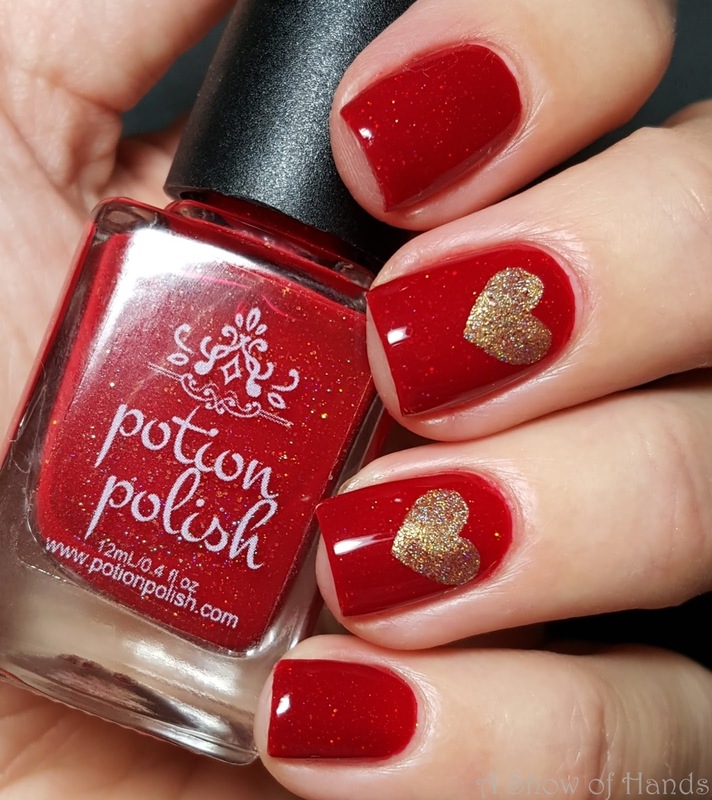 This is a shimmery gold polish with red flakies and was part of a holiday duo with Polish 'M to raise money for pit bull rescues. Today I have the third theme for this month's Nail Art Ideas Linkup (N.A.I.L.) - Boxing Day! I wasn't really sure what to do for this one, but when I read that the idea behind this theme was "the practice of regifting and 'what must I do with this unwanted gift'" I immediately thought of the White Elephant Gift Exchange! We did one of these at our office holiday party this year - they can be a lot of fun and they're definitely entertaining! The base color I used here is Pretty & Polished She's A Brick House. Guys, this red - it's so perfectly dusty and gorgeous! For my "white elephant" I made a decal using a super cute elephant stencil from TwinkledT. To make the decal, I first stuck the stencil on my stamping mat. I have the clear stamping mat from DRK Nails - this was my first time using the mat for anything and I love it! Next I painted in the stencil using a white polish and then carefully pulled up the vinyl. Once the polish dried, I stamped over it with a black polish using a paisley image from Vivid Lacquer plate VL 041. I used a clear stamper (also for the first time) and I was able to see exactly where the stamp was going to go on the decal. Another "trick" that I used was to take the stencil that I peeled off the mat and place it over different stamping images to get an idea of what the end result might look like. On my first attempt, I simply peeled the decal off the mat and stuck it to my nail with some top coat. Then I top coated my nail and the decal melted all over the place! It was awful, lol! 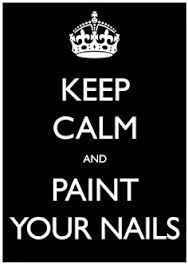 I quickly made another one and reapplied polish to my nail. This time I top coated the decal after I stamped it. Then I applied it to my nail and top coated again and voila! And here are some pictures from our Costa Rica trip! 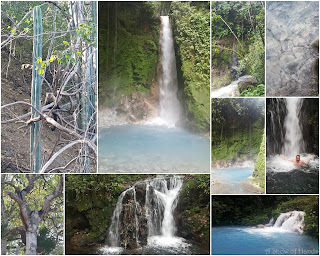 We had such a great time - I already can't wait to go back! Thanks so much for reading! Be sure to check out the other Boxing Day manis, too! Hi, guys! 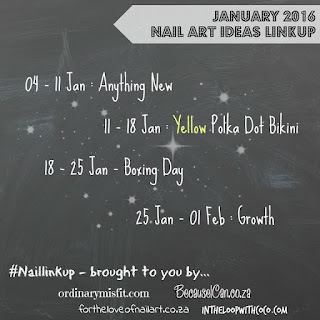 Tonight I have my mani for the second theme of this month's Nail Art Ideas Linkup (N.A.I.L.) - Yellow Polka Dot Bikini! The idea for this theme was to think SUMMER - summer time fun, songs, sun and swimwear! 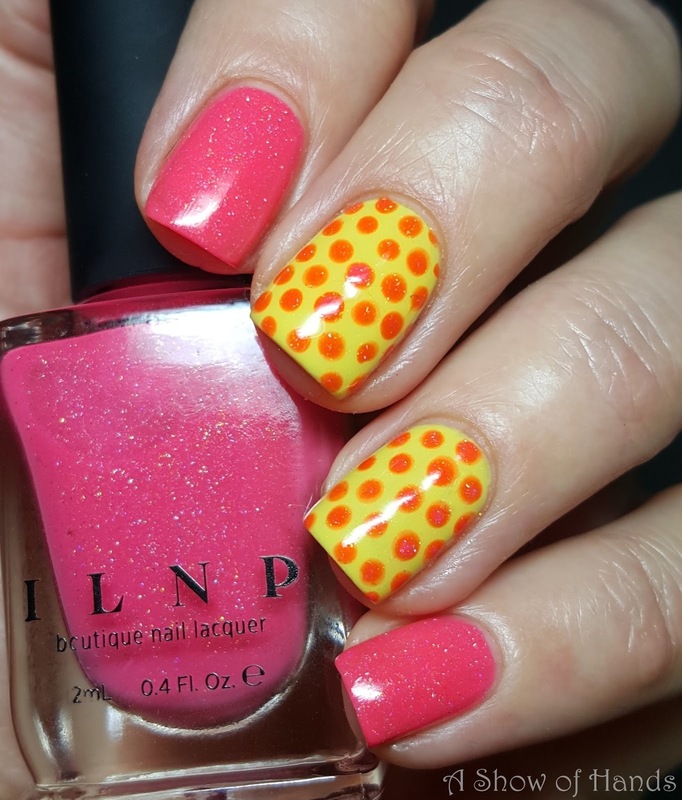 On my pointer and pinky I applied ILNP Summer Crush - how awesome is this pink?! The happy yellow on my middle and ring fingers is Vapid Lacquer Lemon Drop. Unfortunately, when I applied my dots Summer Crush gave me the middle finger and decided to look kinda orange. Ah well, I forgive you Summer Crush because this mani is still fun and dotty and summery. Thanks a lot for reading and please check out all of the other cute Yellow Polka Dot Bikini manis, too! Hi, guys! 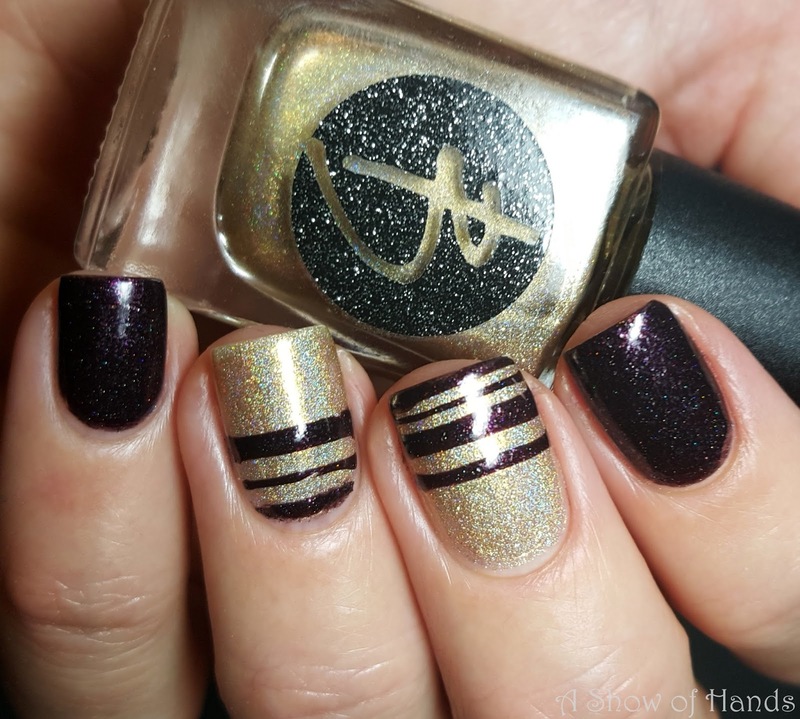 Tonight I have a pretty simple stripes mani to share with you. On my pointer and pinky I applied Bliss Polish Bad To The Gnome. 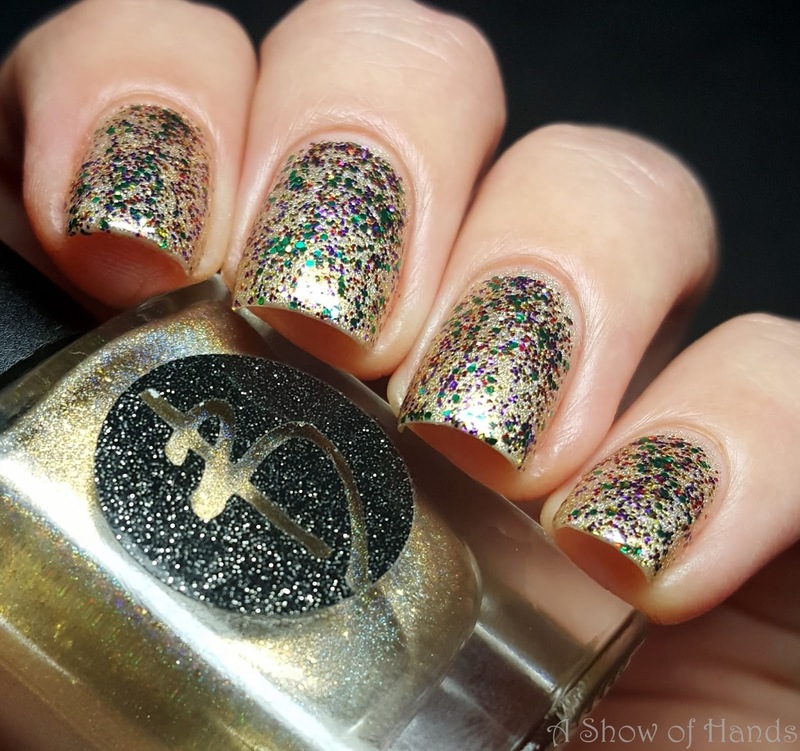 On my middle and ring finger I started with Bliss Polish She's A Winner - this gold holo is soooo pretty! 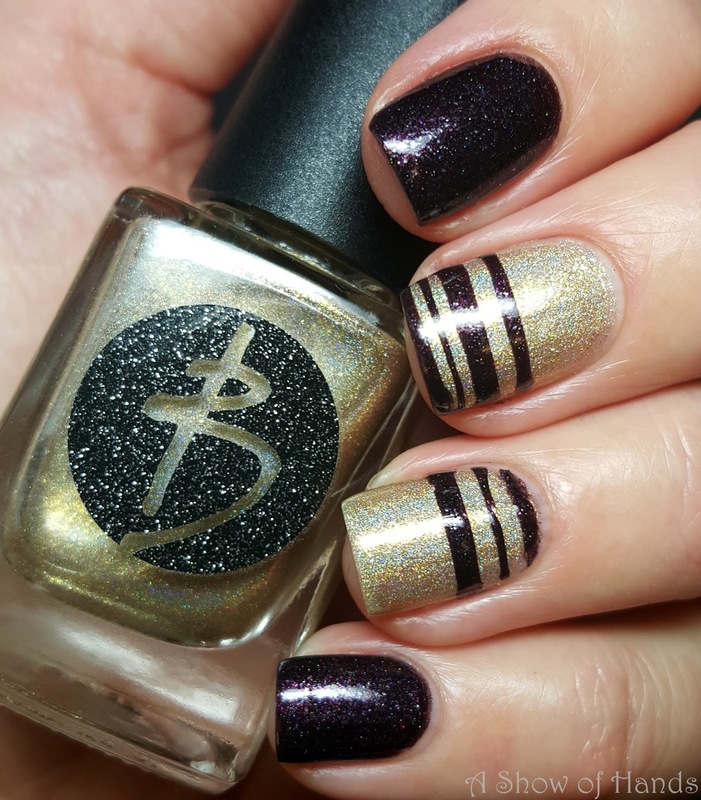 Using some uneven line stencils from Vinyl Boutique, I added some stripes to the gold nails with Bad To The Gnome. I really enjoyed this look! Thanks so much for reading! Hi, guys and Happy New Year! 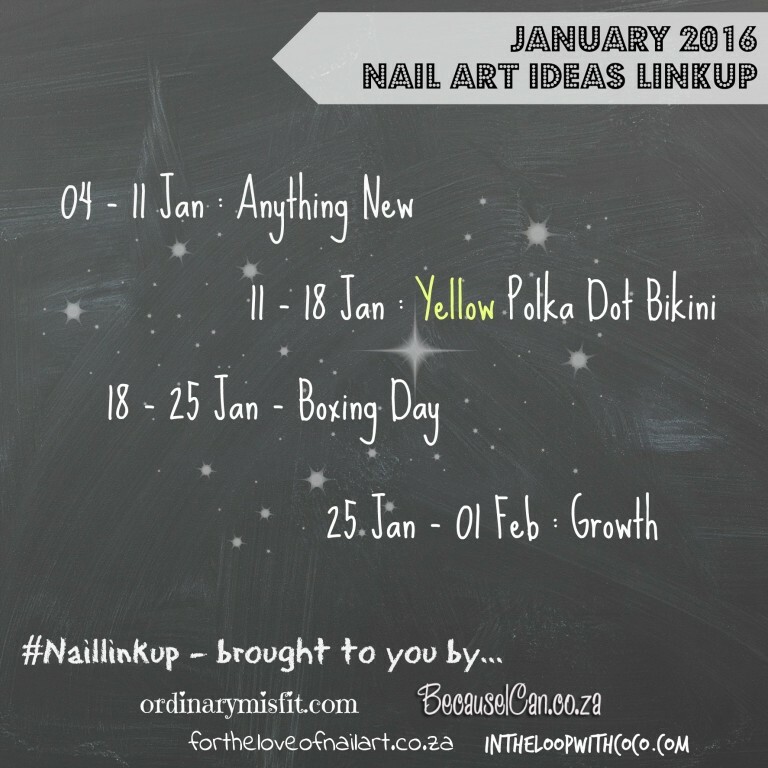 Tonight I have a mani for the first of January's Nail Art Ideas Linkup (N.A.I.L.) themes - Anything New. The idea behind this theme is polish(es) you may have gotten for Christmas or acquired during the holidays. 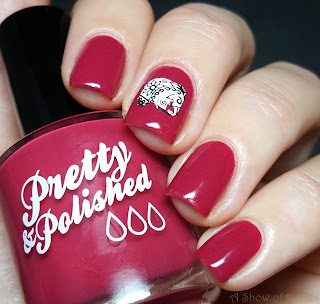 I used two brand new polishes for this mani! 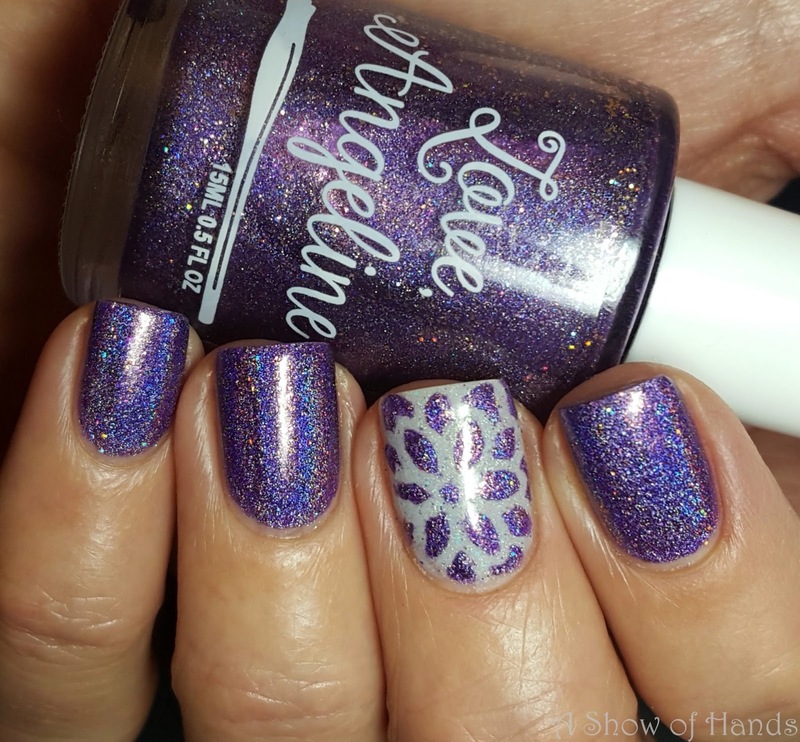 I started with Love, Angeline 01/16 on all of my nails except for on my middle finger - there I used Vapid Lacquer Unicorn Egg. Both of these polishes are stunning! I will definitely have to feature Unicorn Egg in a mani of its own sometime. Thanks so much for looking! I hope your new year is off to a great start and please be sure to check out the other Anything New manis, too! Hello and welcome to my blog! For any questions or comments, please feel free to e-mail me at jmbisho@gmail.com. Thanks for visiting! All polishes were purchased by me.